Starting with the bridal bouquet, I begin filling in the sheet. Notice I've listed everything in her bouquet, starting with "pink roses" and continuing on with "Billy Balls", "Black Callas" and so forth. One the bride's line, I then list the number of stems that I will use for her bouquet. This is extremely important, because you will use this list later as you begin to design. 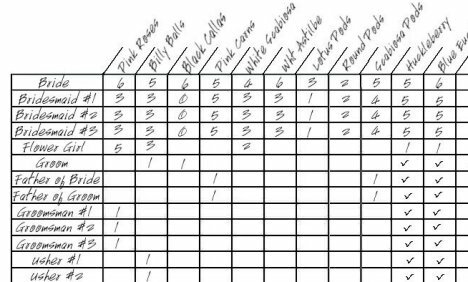 If while designing I suddenly decided that 10 roses looked much better than 6, I would have to check my sheet to see if I have 4 more roses to spare. Changing your design recipes after ordering your flowers could run you short on flowers before all your designs are finished. However, every good florist orders in a few additional flowers. Keep in mind that this is a living, growing product. You may unroll a bundle of roses to discover a flower head snapped off, or one rose stem doesn't reach far enough down into the water and is found limp the next day. Always allow for some overage. This only makes sense. Not every flower is going to be perfect, but you need to pay attention to details, like not over crowding buckets or placing broken stems immediately into a short juice glass so you can use it for a boutonniere. Get all the mileage you can out of every flower you pay for! If you are following a specific flower recipe listed on my site, you can then create a smaller (but similar) recipe for your attendant bouquets. If the bride has 6 roses in her bouquet, you may list only 4 or 5 for each bridesmaid. 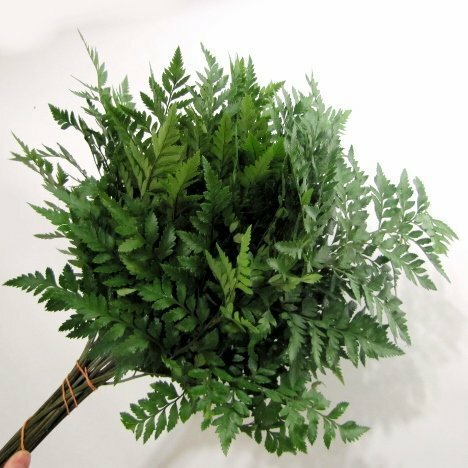 You may omit some of the more expensive flowers (such as callas or freesia), or substitute something similar but smaller. For example, if the bride has 6 standard roses in her bouquet, you may purchase spray roses (smaller heads) in the same color for the bridesmaid bouquets. This is where you get creative and compliment the bride's bouquet by designing smaller or less flashy for the bridesmaids. If the bride has all pink roses and carnations for her bouquet, smaller round clutches of just pink carnations for the bridesmaids would compliment her larger bouquet very well and keep the flower costs well within the budget. This doesn't have to be boring however, let's take a look at the boutonnieres. For variety, you'll see that the groom has a 1 (meaning one stem) of yellow Billy Balls, 1 black calla (matching an expensive flower in the bride's bouquet) and a piece of huckleberry and blue eucalyptus as the greenery. Why do I only have a checkmark in the greenery box? That just means a piece cut off a single stem . . . not using the entire stem. 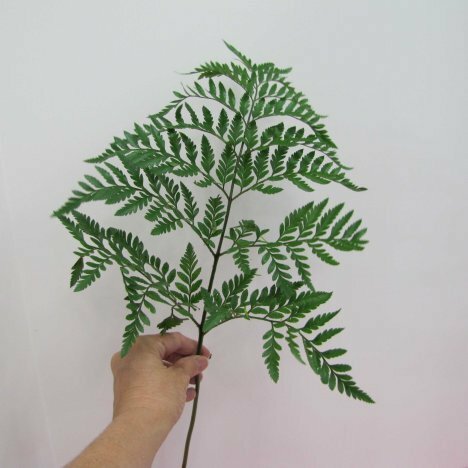 As shown below, using one stem of leather leaf fern can supply enough pieces for 5 corsages and 5 boutonnieres. So keep in mind for every check mark to add an additional stem of that flower variety or greenery for every three or four check marks on your grid. Check the small print before ordering and see how many stems come to a bunch so you calculate how many you need to order. When planning your flower recipes, mix it up a bit. 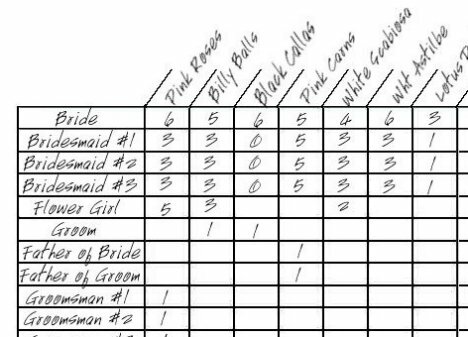 As you see on the worksheet, the groom will have a black calla and a single yellow Billy Ball in his boutonniere, while the groomsmen have a single pink rose, plus a bit of greenery. Look at the fathers and their boutonnieres will be made of miniature spray carnations (that will match the grandmother's corsages). This is where you get creative and work out how to use up any extra flowers. The ushers, however, have a single yellow Billy Ball. All of these flowers are in the bridal bouquet, so her groomsmen look unique, yet all compliment the overall design and flowers found in the bridal bouquet. Once you get to the bottom, you simply total up the column. Remember - each column is number of stems needed. Although some larger flowers (such as hydrangeas) are sold in single flower stem units, most flowers are sold in grower's bunches. Now the totals on the bottom have to be turned into "bunches" so you know how much to order. You'll see that there is a total of 23 pink roses. You cannot order just 23 roses. Roses come in bunches of 25, so you round up to total to the next nearest bunch. In this case, one bunch (25 stems) of pink roses will be enough plus two extra roses. 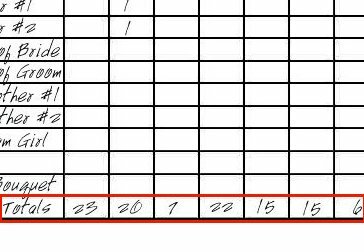 If you had needed 28 roses - you would have to round up to 50 stems (25 + 25) to have enough roses. Thus you would have the 28, plus 22 extra. You should have a plan in your mind what to do with your extra flowers once your needed designs have been finished. This may mean that you have enough left over flowers to do a throw bouquet, a few extra corsages or a centerpiece for the bridal table. After ordering, the next step will be processing the flowers correctly. Read those pages BEFORE ordering . . . spending a few extra dollars is well worth the cost of those products. If these are wedding flowers, you'll want to treat them like a professional florist would. That means using the right products rather than a bottle of soda pop flower additive advised on some "save money" website. Measure your flower products and follow the recommendations on the bottle. It makes a difference. Now let's talk about setting up your work space before the flowers actually arrive on your doorstep.